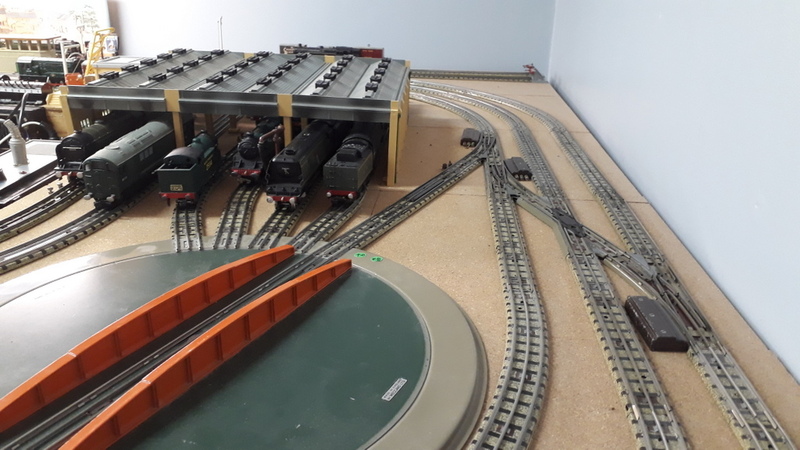 Ray is a frequent poster on the Facebool Hornby Dublo Group and he has allowed me to add his layout to my Other Layouts section of my website. Ray runs Hornby Dublo, converted Wrenn trains, Trix and modern engines converted to 3 rail. He also runs Trix, Triang and Heljan under a section of catenary on his layout. He posts lots of videos and some of these have been included. A photo of the overall layout. I think you may be interested in a project I recently carried out. My rake of SR green Mk.1 SD coaches was missing a full brake in green so with a scanner & Photoshop, I produced these overlays for the SD full brake, while I was at it,I resized them to convert a Trix Mk1 coach. 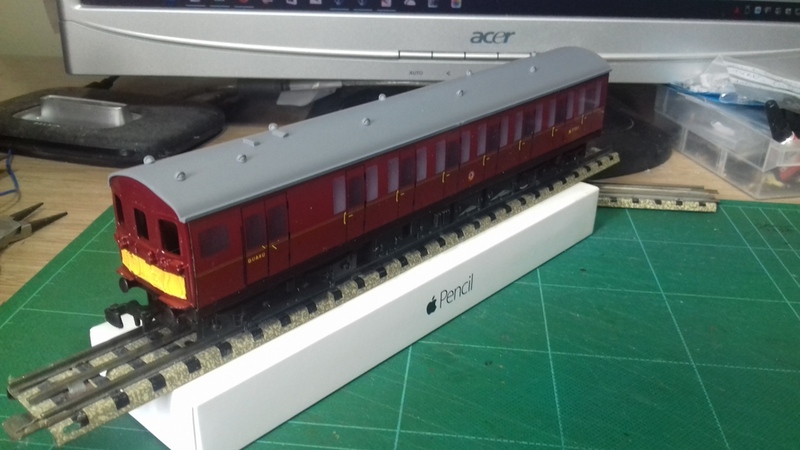 If you want a copy of the artwork to print out,let me know & i`ll email them to you.The green version is the Dublo coach, the second is the Trix coach & the third is my never produced Maroon 3 car EMU. Many years ago,the mid 80s i believe,a model shop in London ,Hadley Hobbies,sent me a sample pack of JV catenary,a French product,which was a pretty accurate version of mk.1 25kv catenary with very fine soldered catenary. I still have this sample pack & will post a pic.It`s still available from a company called Marno LTD.It`s on google. 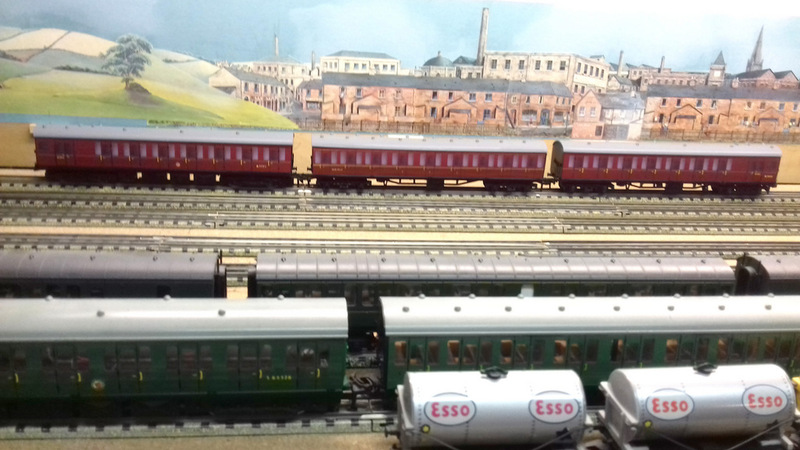 A line up of some of my AC & DC electrics.The trix AL1 is 2nd from the front behind the Triang EM2.The idea was that the layout was built to run trains but it seems to have turned into a test bed for these,my converted other make locos & EMUs + my restored HD locos. Getting ready to 3 rail my latest acquisition. Lyme Regis.Since I have a few Marklin skates in stock,rather than buy & wait for a Dublo collector,i thought i`d use this.I have used these before on Dublo locos & other makes.Easy to fit,getting the long 6ba screw may take a bit of searching on the auction site but they are available,you only need them for WC & Diesel shunter conversions.You will have to enlarge the hole in the p/up to get the screw through & fit a 6ba brass washer to contact the phosphor bronze of the p/up to make contact with the screw but the rest is pretty much plain sailing.the other pic is of the connection on top of the chassis. Finished at last The tender chassis has been miiled down at the edges & a slot milled in the rear buffer beam to accommodate the ladder & two water filter boxes made out of 20thou plastic card.It has been painted with Railmatch coal black paint.It does haul 11 Dublo tinplate tank wagons & a brake van but i think that`s about the limit as Dublo D1 wagons have the rolling capacity of a brick!.I`ll take a video in the next few days.Now,onto the next project. Modern Loco drive Hornby Railroad Evening star.I`ve fitted the tender body to a Dublo 8f tender chassis fitted with plunger p/ups ,the original tender was too light.As you can see,it isn`t quite finished yet,some details still to added to the chassis & it works on a short piece of track on my workbench.Hopefully,a video in the near future. First pic of my Wrenn spamcan conversion.I made a new copper clad p/up mount using the original as a pattern.I drilled & tapped a 8BA hole & screwed the pick up to it using a shortened 8BA Csk.brass screw so that it could be removed to gain access to the fixing screws.A small hole was drilled through the collector base & copper clad & a length of extremley fine wire(from Allcomponents)was soldered to the p/up & fed through the hole in the chassis & on first test,it runs very well,it does run in reverse but i can live with that at the moment even though i have a Ron Dodd magnetiser.Clearances for the p/up are very tight on this model so a countersunk screw is essential.Video to follow later. Just to show that most manufacturers locos can be converted to 3 rail.this is my Airfix Royal Scot using a Marklin skate. 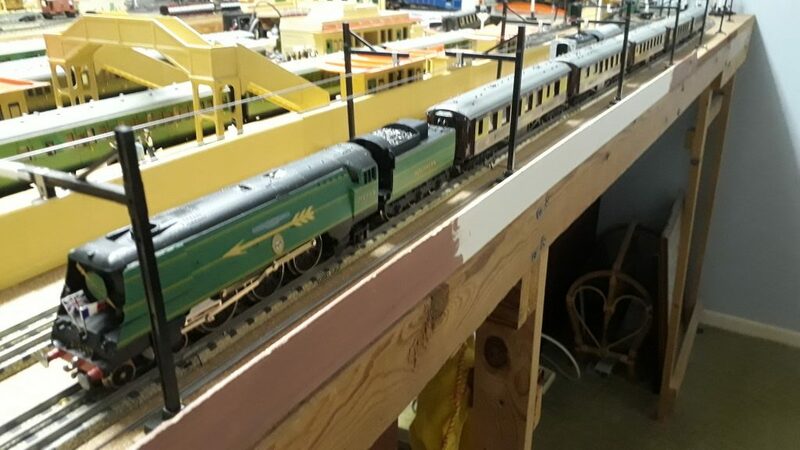 A new project for Ray was converting a Silver King to a full valance Sir Nigel Gresley. Perhaps a few words on how SNG was created.The Silver King body was given to me with the cylinder covers cut off.A wooden pattern was made to fit the curve of the valance & the shape was transferred to a sheet of brass which was then,using Araldite Rapid,fixed to the body.It was filled & primed & painted with Railmatch Garter blue.The chassis was an easy conversion removing most of the vave gear & making a new nickel silver connecting rod.The slide bar assy. 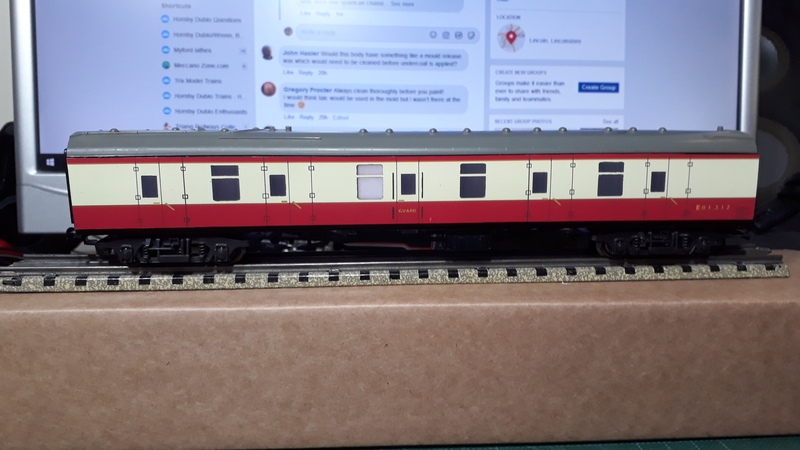 was modified as in the pic.I also have a silver grey Silver king but this time,the full valve gear could be squeezed in. A Trix A2,A.H.Peppercorn,converted to run my HD 3 rail layout.Not having converted one of these British Trix locos before ,it was a steep learning curve but these are very powerful locos. You mentioned the Trix A2, not being familiar with Lilliput locos it was a bit of a brain teaser. Because the chassis is live. What I didn’t realise was that although the driving wheels were insulated on both sides the bogie wheels were not. When I ordered the centre rail p/up parts, I should have ordered insulated bogie wheels as well. However all was not lost. 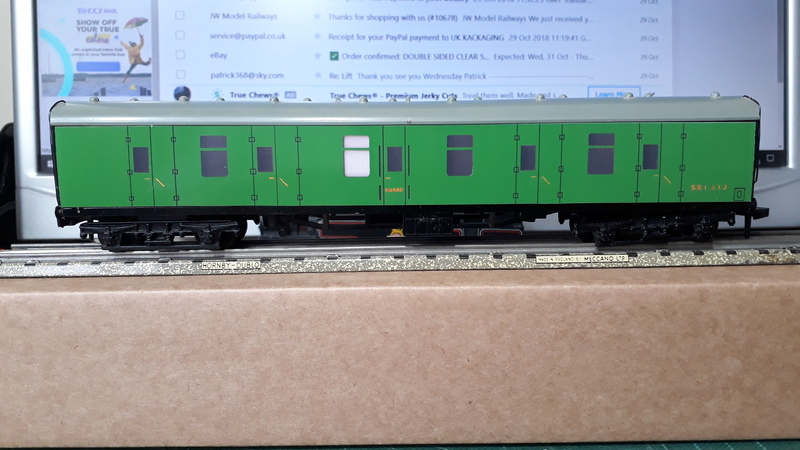 I connected both sides of the tender p/ups, the loco being a loco drive model but wiring it to the motor gave a dead short .I overcame this by removing the wheel keep plate, opening out the original hole for the p/up assy & tapping it M3 for a nylon csk screw. several layers of black pvc insulating tape was applied to the chassis & the collector assy was fixed in position with the nylon screw & a very fine wire soldered to the p/up & connected to the insulated carbon brush spring. All parts are available from the TTRCA but you have to be a member but it`s only £14 a year & gives me access to a lot of Trix spares. A multimeter is a must if you do these sort of conversions yourself,all sorts of annoying short circuits can pop up. 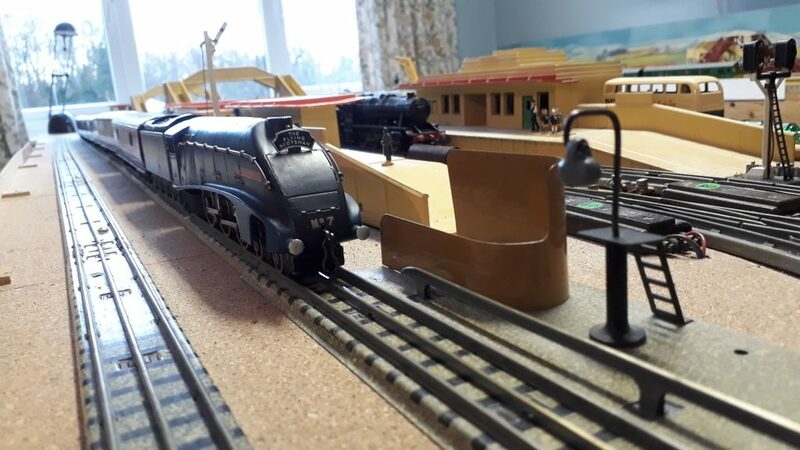 In finishing,I`ve sent you a pic of my Wrenn Golden Arrow spamcan & pullman train & the latest development of the loco shed & my from new in about 1950 Sir Nigel Gresley which was bought for me for Xmas by my parents.